Naperville, Ill., now is able to effectively track its spending — and is allowing residents to do the same. Before implementing spend analysis, Naperville, Ill., was looking for a way to better understand where it was spending money. Now it has found a means to save money, enhance transparency and create a platform for intergovernmental cooperation. 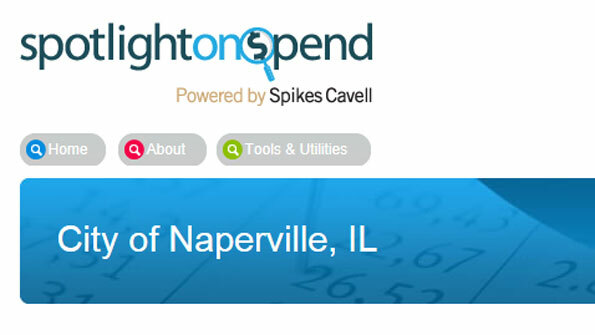 Procurement in Naperville is centralized and accounts for approximately $140 million a year. That amount covers everything needed to run the city, including construction and professional services. The city spends money in a variety of ways: purchase orders, check requests, petty cash and a large pCard program. The Purchasing Division knew what it was spending through contracts and purchase orders, but needed more detail. The data necessary to help make effective procurement decisions wasn’t being captured in the finance systems, and classifications sometimes were inaccurate or missing. Following a request for information, Naperville decided to partner with Herndon, Va.-based Spikes Cavell to implement the Observatory — a suite of data-driven, online tools. After two years, the most important contribution from the project continues to be the ongoing cash savings. The city has seen collateral benefits as well: improved cash management by department managers, effective compliance audits and pCard program optimization. Even more significantly, the Observatory and spend analysis have enabled Naperville to move to the next level of transparency. While many jurisdictions are struggling to make contract spending available to the public, the comprehensive analysis has allowed the city to make its spending accessible to the public. 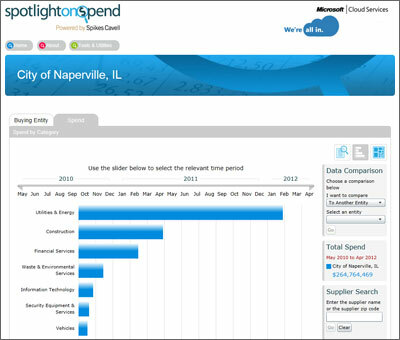 Through a site called “spotlightonspend” launched this past summer, businesses and residents now can access Naperville’s complete spend data and see where every dollar goes regardless of the payment platform. The data can be downloaded in various formats, and the site can provide aggregations with comparisons to other participating jurisdictions. It also allows visitors to understand local, regional and national spending patterns. The program additionally has highlighted opportunities to collaborate with the local park and school districts, which also have implemented the Observatory. Naperville also has begun to integrate data with neighboring cities, including Aurora, Rockford and Joliet, and combine purchases, improving the communities’ buying and negotiating power. All of those opportunities are helping to facilitate much-needed, intergovernmental cooperation and save money, while increasing efficiency and effectiveness.